The “grimy” new synth can be pre-ordered now for $149. 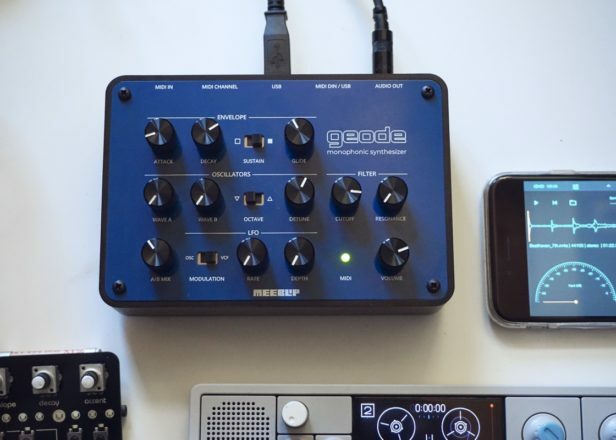 Synth manufacturer Blipsonic and music tech site CDM have launched the latest in their family of MeeBlip synths, a $149 monophonic instrument called geode. According to Blipsonic, geode has one goal: “to let you plug in a box and dial in edgy, cutting, grimy sounds you won’t mistake for anything else”. The synth has a one control per function design, with two independent digital oscillators and an analog filter based on a ’70s guitar distortion circuit. As well as the option to mix both A and B oscillators, the synth has a few others tricks up its sleeve, such as modulation routing to filter and pitch “for subtle effects or cranked for chaotic warbles and FM-style sounds” as well as dual mono minijack output for easy monitoring with headphones. The synth is powered via USB, and includes a 1m USB cable. The geode synth is the fourth in Blipsonic and CDM’s MeeBlip range, following the original/SE, anode, and triode models. It can pre-ordered from the MeeBlip website for $149.95, with shipping expected to start in May. Listen to audio demos of the synth below.